Keywords in Case Logistix® help you find key terms relating to a litigation theme or concept central to the review process. The library administrator creates keywords in the Library Designer. Then those terms are highlighted in documents and visible on the HTML tab. 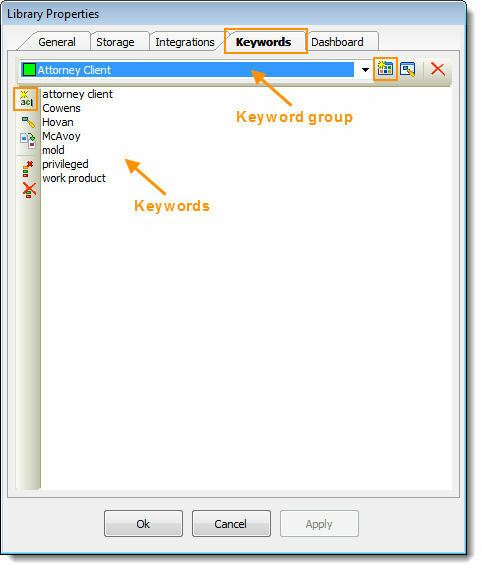 Keywords are organized into keyword groups. To view the keywords in a keyword group in your documents, click the Mark-up tab. Then click Keywords on the toolbar and select or clear the check box for the keyword group you want to view. Once you have selected the keyword group, click the HTML tab. The keywords are highlighted in your documents. On the Tools menu, click Library Designer. The Library Designer window is displayed. Double-click the Library Properties icon in the right pane. In the Library Properties dialog box, click the Keywords tab. If you want to add a keyword group, click the Add keyword group icon. Then type a name for the group and then select highlight colors for the group in the Add Keyword Group dialog box and click OK.
To add a keyword to a group, click the group in the group list, then click the Add keyword icon. Type the keyword in the New Keyword dialog box and click OK.